Don't know if you saw the BBC's 'tribute' to Group B rallying 'Madness on Wheels: Rallying's Craziest Years' on BBC4 last night, but it's worth a look on BBC Catchup, or iPlayer, if you missed it. It brings back great memories, but there are some truly scary bits in it too. 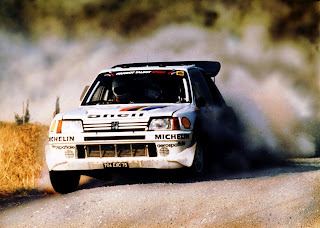 But oddly enough I came across news today about more Group B Rallying. Apparently an event is being organised in August primarily for Group B rally cars. The ‘Rallying with Group B’ car club has already reserved over 60 places for its members and their cars which sounds as though it will provide quite a spectacle. The event has already attracted a title sponsor with Michelin conforming its presence although the route has yet to be finalised. However, it will take in the roads of Cheshire and North Staffordshire, with Special Stages in the grounds of castles (like Holesworth and Cholmondeley), stately homes and service at Oulton Park race circuit. Sponsored by Michelin, the rally will take place over the bank holiday weekend of 25/26 August. Could be worth a visit if you’re not going to the Skye Rally Sprint that weekend!